These pretty-much-perfect months are a great time to escape the city, and with so many fun, scenic, and informative offerings nearby, you can go for the day and not have to worry about spending money on lodging. To help plan your autumn itinerary, 6sqft has put together a list of the best day trips outside of New York. From touring the Rockefeller estate in Tarrytown to a lantern-lit cemetery tour in Sleepy Hollow, we’ve got you history buffs covered. 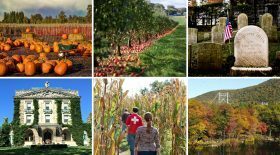 And for those looking for some more traditional fall fun, there’s fall foliage at Bear Mountain’s Oktoberfest, apple and pumpkin picking in New Jersey, and artistically carved jack o’ lanterns on Long Island.